Founder of Barre & Soul, a community of barre & yoga studios strengthening body, mind & soul. Innovator in fitness & women's issues. Straight answers on what a real barre class is and is not. You've heard your friends raving about it. You've seen it all over Instagram. Your incredibly fit co-worker swears by it: the barre workout. People won't stop talking about barre class, and every time it comes up, there seems to be a new studio opening. So you put on your stretchy pants, you pony up $25 for an hour of tiny pulsing movements and you wonder: Is this for real? How can I tell? The truth is, barre workouts have recently gone mainstream after decades as a niche offering with an almost cult-like following for its ability to deliver transformational results. The complex thing about today's world of barre is that at this time, there is no governing body, no single authority that certifies whether certain studios and classes are up to par at the barre, or not. The industry hasn't caught up with this explosion in popularity. This means no one is moderating or monitoring the dozens of studios that have popped up calling themselves "barre." No one is double-checking the instructors who are charging top dollar for classes that don't live up to the name. Many a studio has hung mirrors and ballet barres along one wall, mixed some yoga moves with a few deep pliés and raised their prices without proper training. That's just not right. I want to advocate for the real deal. And by "real" I mean authentic barre studios that are practicing in the tradition of the Lotte Berk method -- where barre was born with thought, rigor and a thorough background in movement to inform the practice. By "real" I mean studios that devote time to ensure their instructors are thoroughly trained, knowledgeable and capable of delivering excellence in authentic barre to a wide range of clients. This level of training takes time and certainly can't be taught in just a weekend. I can speak about the barre workout because of my years of experience and rigorous training. I discovered barre many years before it was on everyone's radar and I transformed my passion into an in-depth study, and a fulfilling career. I've taught literally thousands of barre classes and led in-depth 275-hour barre teacher training sessions under the mentorship of Elisabeth Halfpapp and Fred DeVito, the creators of Core Fusion at Exhale, who managed the Lotte Berk method in NYC for decades. Barre aficionados worldwide consider this pair to be the world's foremost living barre experts. Their book, Barre Fitness, dives into more details. After working under them as a manager, teacher and teacher trainer for several years, I went on to open my own yoga and barre studios and cultivate a very intentional, honed approach to barre, called Barre & Soul. It emphasizes mindfulness and soul -- acknowledging that you are so much more than a body. Professional German ballerina, Lotte Berk, first created the method we now refer to simply as "barre" and taught a devoted following in London in the '60s and '70s. Berk said barre should be a "a mélange of strength-training, dance, orthopedic back exercises, and Hatha yoga all rolled into an intense, hour-long mind-body workout to driving rhythms followed by an inspirational cool down." She was meticulous about form, function, method, pacing, position, isometric technique and other elements of the method she crafted, refined and taught to her clients. I was trained in the tradition Lotte Berk created, and as a result -- I know well the power of barre and what it can achieve. I know what it is and I know what it's not, and I think it's important for others to be able to tell the difference, too. These classes are expensive; you deserve to get your money's worth! Instructors who aren't properly trained might spend several minutes directing students into position. If you're working through 10 positions and transitions between positions take a minute and a half each time, that's almost 15 minutes of your workout that's wasted! A properly trained instructor can move students into the correct position quickly, so they can spend more time actually working muscles, refining their form and getting stronger. True barre instructors understand how to lead workouts that are safe; they can spot a student who is overextending herself or about to injure herself. They can suggest and lead modifications. They understand how to structure a workout in the best, most time-efficient way -- which muscles should be worked, for how long, and in which order. Instructors who aren't properly trained don't necessarily know enough to prevent student injuries or how to design their classes to help you get the most out of the workout. While any workout is better than no workout -- wouldn't you rather spend your time and money on a real barre class that will get you real results? A real barre instructor will structure the class so you get an amazing, efficient, complete workout in just an hour. A well-led barre class can burn hundreds of calories both during the workout and at rest due to increased muscle density. It can improve your posture, balance, and mind-body connection. The more highly trained your instructor is, the better and more effective your class will be. Not surprisingly, someone who only had a weekend of training (and sadly, this is common) will struggle to create classes that are truly efficient or powerful. How can you tell if your instructor is properly trained? Most studios include instructor bios on their websites, listing everyone's certifications and training background. A legitimately trained barre instructor will have at least 100 of hours of training before they start leading classes. Preferably their training traces back to the original Lotte Berk Method in some way. You should be able to find this out by doing an internet search for the studio or method in which they've received their training. It is worth noting that a Pilates certification is not a barre certification. Time spent studying or performing ballet also does not a barre instructor make. A properly trained barre instructor will walk the room during class, giving students hands-on adjustments in addition to precise verbal direction to help them correct and continually enhance their form, and never stop challenging and strengthening. This is something instructors hone through hundreds of hours of training and practice. An instructor can not learn in an abbreviated teacher training session how to correctly and swiftly adjust a seasoned athlete in their 50s, a client in their 20s embarking on their fitness journey for the first time ever, a devoted yogi exploring the difference between yoga and barre after recently having her first child and a barre enthusiast looking to take this challenge deeper than ever -- all in the same room. Fine tunings from your instructor are the difference between results that range from "meh" to mind-blowing. A true barre workout concentrates on one muscle group at a time, working that group from a challenging starting position and then moving through a high number of tiny, precise movements to the point of fatigue and beyond. Once you've reached that point, you're finished working that muscle group and it's time for a targeted stretch. If your instructor leads you through a series of exercises that all target the same muscles repeatedly -- quads, glutes, abs, quads, glutes, abs -- chances are, it's not a real barre class. There is nothing wrong with cardio or dance classes. They just aren't what authentic barre classes are about. Despite its origin in the ballet world, barre doesn't incorporate dance or serious, sustained cardio. Barre is about strengthening muscles through isometric-based movements and holds, followed by guided stretches. A real barre class maximizes flexibility as well as your body's endurance and strength. So -- if your instructor is leading you through choreography, you might learn some fun moves, but it's not a real barre class. There is no commodity in the world more precious than your time. When you're spending that with your hard-earned money on a barre class, you deserve a fantastic, empowering, strengthening workout where you see real results and transformation. 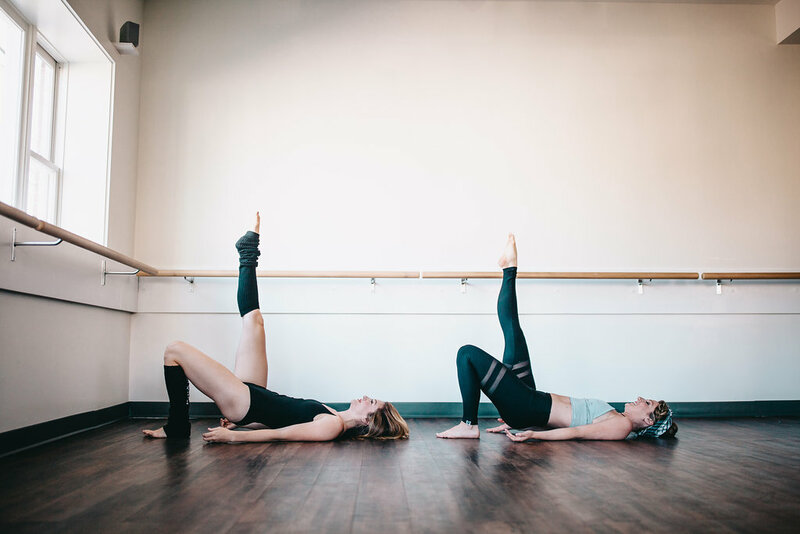 A real barre class will serve you well in the short-term and the long haul -- keeping you coming back for more thanks to a highly trained teacher. It boils down to expectations, consistency, quality and value. And I acknowledge that everyone has different fitness preferences. You might not be into the whole group fitness scene at all -- and that's perfectly okay. But if you're looking for a genuine, authentic barre class, its important to understand what it looks and feels like. Now that you know how to spot a real barre studio, and identify the imitators -- I hope you'll sign up for a class soon, get your barre burn on and experience how this practice can truly change your mind, body and soul.